Hong Kong people are never bored about food choices – from TV programmes to mobile apps, we are constantly fed with news on latest food trends, new restaurants and hottest deals, and our shopping carts are always targets of food manufacturers who compete among themselves to please the tastebuds of the ever demanding consumers. However, while most people care about taste and costs when it comes to making food choices, few would ever ponder over what their food is really made of, and how they are made - except for the food-conscious ones who gather together not only to share their knowledge on good food but also promote the belief of conscious eating: School of Everyday Life organizes twice a year an Organic food fair and conducts regular workshops on food additives and permaculture; An organic apple snack maker strives to develop local-made natural products with a fair price; A group of parent gardeners and primary school students run a roof-top farm that houses near 400 boxes of certified organic produce... Although their approaches to celebrate good food vary, their smiles and the food they hold on their hand share the same glow. In Hong Kong, many people care for animals, and they treat animals as their family members. Yet, according to statistics, 4000 stray and abandoned cats and dogs were euthanized last year. The figure shows that many people still do not respect the meaning of life enough and they do not even understand what life education is. As such, a group of animal protectors, namely Maison de Charlotte pour des Chats et des Chiens, HK Saving Cat and Dog Association, and some cat and dog lovers gathered together to provide food, medical care and even sterilisation services for countless stray and abandoned cats and dogs. What is even more gratifying is that this group of animal volunteers find new owners of these unfortunate cats and dogs, in view of changing their destiny and bringing new life to them. Leila CHAN has already been a reporter for 25 years. She had never imagined herself to have another identity – founder of a charity, let alone other people. 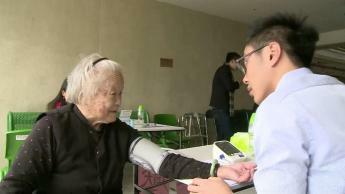 After finishing a series of publications about the life and death education in Hong Kong, CHAN realised that while the survival space for reporters in Hong Kong had been shrinking, the challenge of the aging population facing Hong Kong had also been unprecedentedly mounting. She therefore founded the “Big Silver Community”, a social innovation charity. It makes use of the BIG MAG magazine as a medium to help readers “to save people, money and health”. Meanwhile, it enables the readers to know more about topics regarding healthy life as well as life and death education. What is more important is that by selling BIG MAG at community stores and newsstands, and to organise events which are related to the contents discussed in the magazine, a community care network is built. As a result, the masses and the community can be reconnected, letting everybody plan ahead for the second half of life. Behind our bustling metropolis, there are nearly 10 000 asylum seekers who have left their homeland. They are filing non-refoulement or torture claims to the SAR government, and all they can do is to wait while they can’t plan for their future. Asylum seekers cannot work here; with too much time and too little assistant payment, it is easy for them to take the wrong path. Football school coach Medard founded the All Black FC (Football Club), so that a group of Africans who love football can find something to work on and develop good discipline and habits. Black players have good skill, fitness and speed. When playing the local teams, they often give their opponents hard times. Many local teams who dare to challenge themselves are eager to play with All black FC. 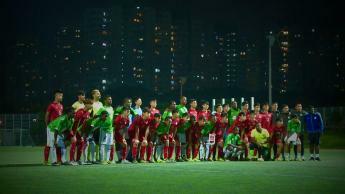 Although the team is approved by many people in the football world, the development of the team is hindered by its identity issues, and there are local amateur leagues that reject All Black FC’s participation. Medard says it does not matter, for maybe they can organize their own competitions, and welcome all community groups to participate. In fact, there should be no boundary to football, and All Black FC is also no longer limited to African players. Young players, including locals and ethnic minorities, have been attracted to join the team. People may have an uncertain future when they are away from their homeland, but as long as they have good hearts and a never-give-up spirit, they can still fight for their pride in the face of adversity. 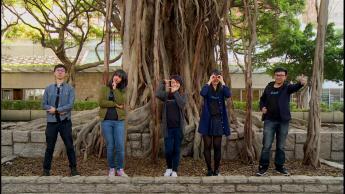 The “Maker” culture has taken root in Hong Kong in recent years. These makers, equally enthusiastic about technologies and their application, often have various interests and strong suits. Among them are several who demonstrate particular concern for people with hand disabilities. Utilising their knowledge and skills in leisure time, these makers endeavour to produce 3D-printed prosthetics that meet the needs of these disabled people, hoping to help them cope in everyday life. As every user faces different problems, makers have to think from the users’ perspectives and understand their needs before making prosthetics. 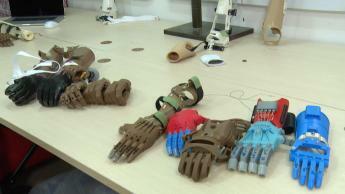 Although 3D-printed prosthetics are not exactly health products, they do offer an alternative for the hand disabled and benefit those in need. These makers also connect with non-governmental organisations in West Africa. After a “Hand Assembling” event in Hong Kong that engages the public in producing prosthetics, the products are then transported to West Africa as gifts for the needy. In the meantime, Mike, the originator of this campaign, takes the initiative to collaborate with schools while promoting the idea of 3D-printed prosthetics. Through complementing the Science, Technology, Engineering and Mathematics (STEM) curriculum of secondary schools, the campaign enables students to make prosthetics, thereby sowing the seeds of research, with the hope of seeing more inventions that bring convenience to the physically challenged. As such, “social inclusion” will be more than a slogan, but a goal that everyone contributes to. As one of the fastest-changing and ever-busy cities, Hong Kong enjoys its reputation for its efficiency. Yet this extraordinary speed of growth and development doesn’t come without a price. While the city benefits from the fruit of its economic success, many traditional handicrafts, be they neon signs, hand-written minibus plates or hand-carved mahjong tiles, are on the verge of extinction as they are either being replaced by new technology or no longer needed. Joyce, who works at a digital marketing consultancy, noticed that Hong Kong people, like herself, tend to lament over the loss of yet another traditional handicraft shop only when they see it on the news. Having pondered what else she can do, she started a social enterprise named “Eldage”, and with her employer’s support, she made use of social media to tell the stories of those handicraft masters to raise the awareness of the public and sell their products online. Meanwhile, she let these artisans share their skills and stories through workshops which in turn attract hundreds of participants, many of which from the younger generations. The platform also draws the attention of aspired young people who offer to be volunteers in reporting, filming and even bladesmithing! Although it may seem impossible to have these handicrafts passed on as it used to to the next generation, by letting more people know about what they are and the beauty behind these craftsmanship, Joyce believes they can be revitalized in some other form one day. Five young people – Himphen, Nelson, Amy, Catherine and Camelie – bring their strengths together in running the crowdsourcing platform “Collaction”, where you can see other people’s dreams and even help the dreams come true. In order to attract more attention to Collaction, the quintet launched projects such as “Timber” and “Snappy” with the aim of encouraging people to partake in community affairs in their own ways. With their professional knowledge, YC and Antony helped a group of secondary school students realise the dream of developing a mobile application “Whereabouts of Minibuses” that brings convenience to busy passengers. 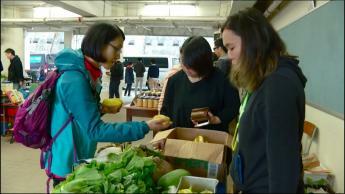 Via Collaction, the “Water for Free” project was able to raise funds for updating its webpage and mobile application, and the “Food Sharing Hong Kong” project also managed to introduce the idea of food sharing to the city. Even though not all projects can run smoothly without obstacles, the five members of Collaction are determined to persevere. They firmly believe that everyone can play their own part, engage in more social affairs, and contribute to a better community. There is a shortage of healthcare manpower in Hong Kong, and it is a well-known fact that the doctors of the public hospitals are facing long working hours and tremendous pressure, hence, not an easy career path. There is, however, a group of future doctors who are determined to walk into community to provide medical services, before the start of their heavy work life. They are committed to return the favour to the general public, with a view to promoting good health to all people. LEE Kong-ngai, Paul, is a year-5 student of the School of Medicine, the Chinese University of Hong Kong. He founded “the Association of Doctors for Social Responsibility” in 2016. Paul hopes that being the convenor, he can bring together a group of doctors, medical students and even aspiring secondary school students, to enter the community to provide medical services. After a year of preparation, he and several fellow medical students ran a campaign called “Hong Kong Health Exhibition” in September 2017. They try to work with different district groups, with the local organisations providing venues and supplies, and inviting neighbours to participate. The medical students will make use of their medical knowledge to do health checks such as measuring blood pressure, blood glucose, etc., and provide related medical services for the people in need. Paul and his working partners hope to promote the concept of “doctors in the community”, so that people can understand their health condition through the free medical services. If there are problems, they can seek medical treatment as early as possible. Maintenance workers often give the impression of being rude, stubborn, sweaty and dusty with a spanner always in their pocket, when in fact they can be quite cordial and meticulous. In the House of To Kwa Wan Stories (“ToHome” for short), a group of maintenance workers volunteer to provide free service for their underprivileged neighbours in their leisure time. Whether it is an old lady living alone whose water heater malfunctions, or a Pakistani refugee who has a leaking pipe at home, these workers do not hesitate to show up at their doors and fix their problems, during which they chat casually with their neighbours about anything from everyday life to social and livelihood issues, thereby reducing the gap between people. In addition to offering maintenance services, these workers also visit their neighbours door-to-door, set up street booths regularly, and organise various activities in festive occasions. Examples are a haunted house at Halloween and a countdown bazaar on the New Year’s Eve. Through these events, they are truly sharing happiness with others and enhancing cohesion in the community. Unfortunately, ToHome is about to be demolished and relocated. We do not know if the connection among these volunteers and their neighbours can be maintained and continued. Yet, as long as the volunteers are still around, the human touch will remain despite changes in the environment. 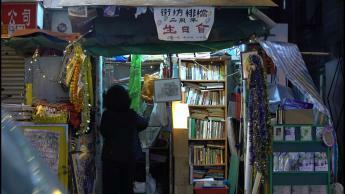 Located in Yau Ma Tei, this market stall called “Kai Fong Pai Dong” is open only once a week. 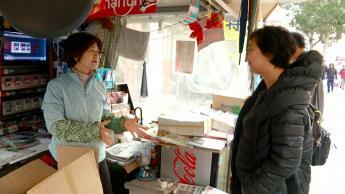 Whenever it is open, residents of the neighbourhood will gather around the stall and have fun chatting with each other. Mostly donated by the residents or kind people, the items are sold at prices freely determined by customers, so as to provide them with an opportunity to ponder the “use value” of things. Kai Fong Pai Dong presents an array of regular activities every month, including film screenings, sweet soup gatherings and street storytelling events, all of which make it look more like a community centre that welcomes everyone than a shop. Although many people did not quite understand the intention of the members running Kai Fong Pai Dong at first, people are now gradually aware of their effort and even “complain” that one gathering a week is not enough. In the past two years, a trusting, intimate relationship within the community has been developed naturally. This kind of connection may be difficult to imagine in Hong Kong nowadays, but as long as we are serious about staying connected and pulling together our strength, a broken relationship can be mended, and a lost community can reappear.